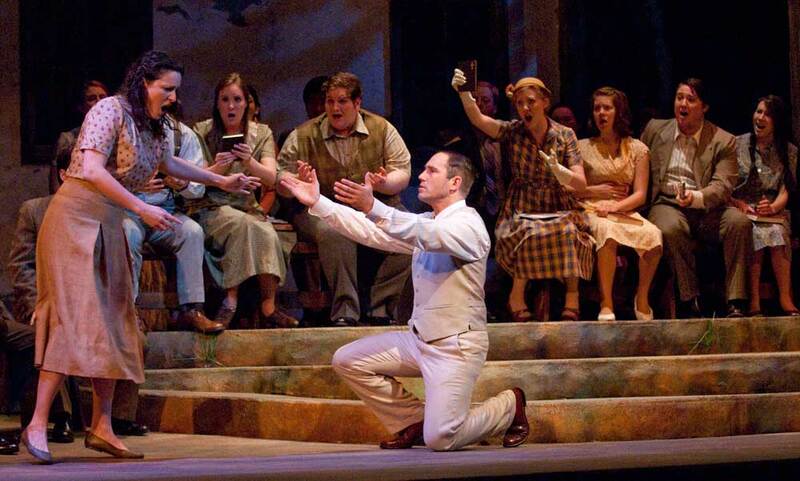 Boston University’s production of Carlisle Floyd’s Susannah, a musical drama in two acts, opened Thursday night, April 15, at that institution’s Huntington Theater. Its Opera Institute and Chamber Orchestra hit bright spots in a mostly dark series of twisted circumstances involving Christian zealots in the rural south. The composer himself was there to take a bow before a near full house. Also there was Phyllis Curtin, who received flowers and applause from those who were able to spot her in the orchestra section. It was Curtin who sang in the premiere of Susannah given in Tallahassee, Florida, 55 years ago. It was quite a night at the, well, we cannot say “opera” for that is not how the creator of Susannah, who wrote both libretto and music, defines his work. Floyd has been in town during the week coaching the BU students. While not as engaging as one would like, both creation and recreation had enough traction to hold attention. As for an emotional ride into the realm of rural religious folk, it was more often even keel than moving. After the opening scenes of near “hee-haw” dancing by the town’s folk and a playfully upbeat, down-home duet between Susannah and her brother, Sam, came little respite from a pervasive menacing undercurrent. Though probably not intentional, the copse of birch visible in all 12 scenes appeared more on the warm, than the ominous side, lit by an orangey glow, beneath a faintly foreboding sky. Green leaves filled in the foreground. The eye-catching sets, in and of themselves, were so good that at times they dwarfed the drama. Clayton Hilley played Sam Polk and became him: he looked, played, and sang like real country folk. Vowels not usually found in the high art of singing found their way here to most refreshing effect. His was the benchmark for believable character. Understanding just about every word he sang was not hard work for the listener. Ashley Logan was Susannah. She will perform again on Saturday, taking turns with Chelsea Basler who will assume that role for the Friday and Sunday dates. A lot of voice comes from this young soprano, Logan. Only a few potentially lovely notes are scored in the drama and she made the most of most of them. Her high register was shrill in forte passages and nearly unbearable in climactic moments demanding a fortissimo or more. Her singing about the starry sky from up on her porch roof would have had more of an impact had many more of the words been understood. She, the supporting cast, and chorus, did not match Sam’s southern sound—with one exception. Deep and often-rounded and sometimes rich bass tones from John Paul Huckle as Olin Blitch, the small town preacher, along with some mighty strong “southern” singing and mostly clear diction were impressive. Omar Najmi shaped his character, Little Bat McLean, into a somewhat quixotic personality through unusual quirky tautness and quickness that became more and more appealing. Both cast and chorus in their country costumes injected enough down-to-earth feeling all around. But their performance spiked to excellent effect in the hymn singing and baptism scene, and then, again, in a most powerful way, in the finale. Sharon Daniels was stage director. The orchestra of 37 players under William Lumpkin produced a veritable brand of threatening sound which served no small role in moving Floyd’s dark music forward. Balance should not have surfaced as a concern as often as it did; instruments not only eclipsed voices, they intruded on the action. But it is worth it all. How often does the chance come along to see American opera performed live onstage with composer and diva in the very midst of a student production? It was a kind of historic moment. 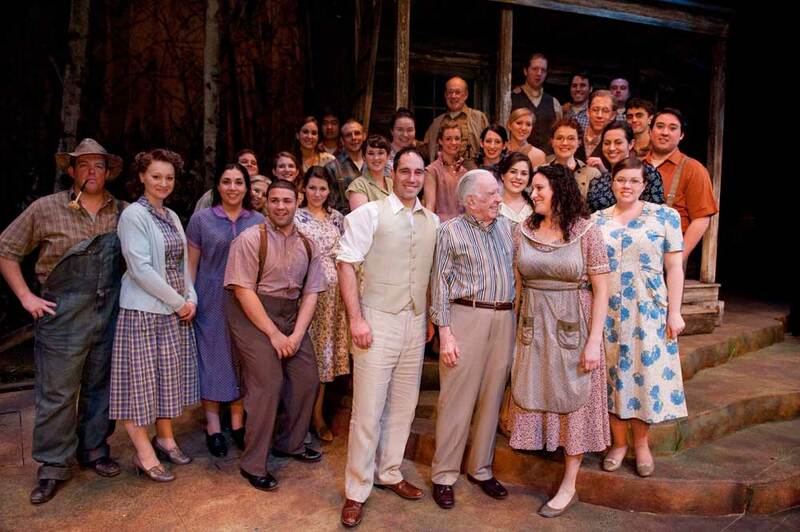 Three more performances are scheduled through April 18. 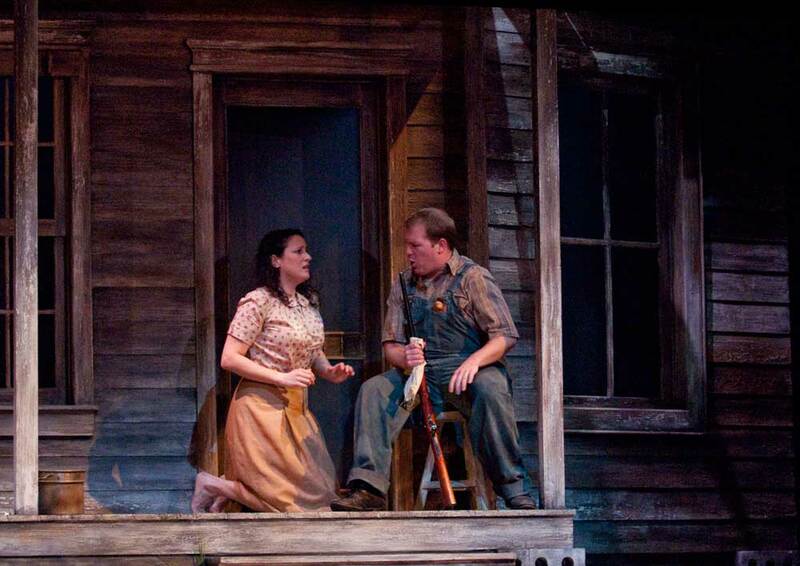 I was at Friday’s performance with Chelsea Basler as Susannah and Adam Cannedy as Olin Blitch. Both did a superb job and were very convincing. I agree that this is a historical moment – and I attended the pre-performance talk by Mr. Floyd & Ms. Curtin which was insightful. My only complaint about the performance is that the orchestra overpowered the singing not too infrequently.